As a mom with just one child, you could argue that I’m hardly uber-qualified to review toys. However, my secret weapon is the fact that I am also step-mom and step-grandmom to a goodly number of kids… So, I’ve experienced my share of kidstuff over the years. 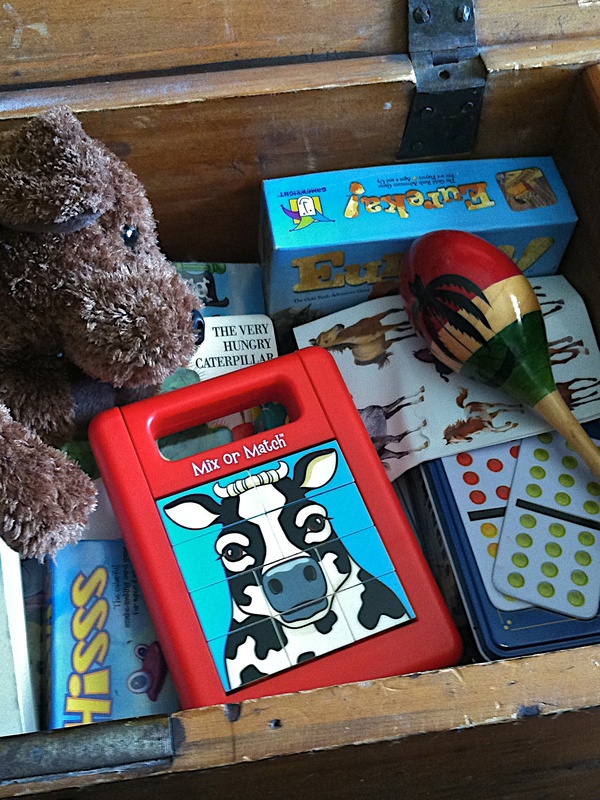 With my husband’s grandchildren living just down the road, our goody-filled toy box helps keep my family ready for impromptu visits. Its been my job to make sure the box does not disappoint. Last night, my husband’s grandson stayed over. Although granddaddy’s favorite little pre-schooler seems to have come from the womb totally obsessed with trucks, tractors and earth-moving equipment (both real and toy versions), last night we found him completely bewitched by the “Mix or Match” puzzle that he’d unearthed in the toy box. The “Mix or Match” by Popular Playthings is both clever and simple to operate. Pull up the handle (which also ensures the toy puzzle is easily carried) to unlock ten rotating blocks on bars. Each rotating block’s four visible surfaces feature one of four different animals… cow, rooster, sheep and pig. By spinning or rotating each of the blocks, the puzzle idea is to coordinate the images on the blocks to come-up with a matched face. 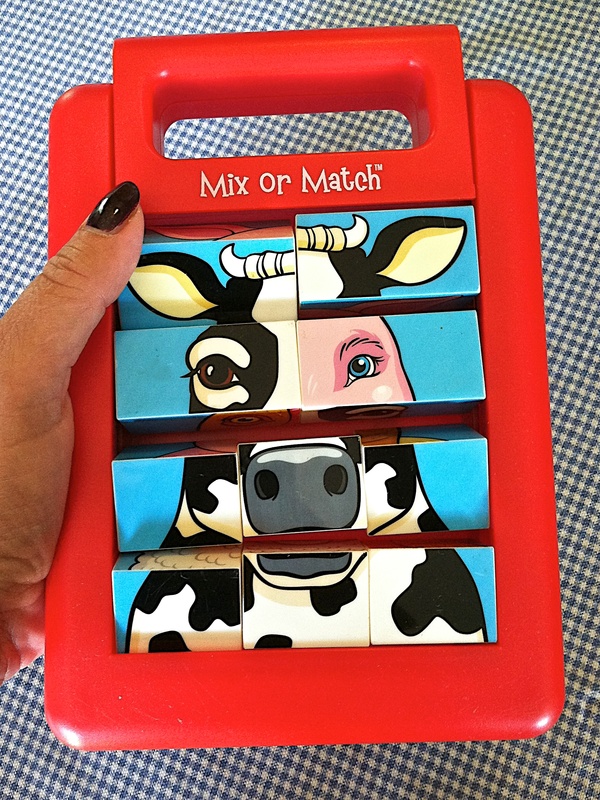 Once all the blocks match (ie, you have the complete face of the cow, for example) push the handle down to lock the face in place. 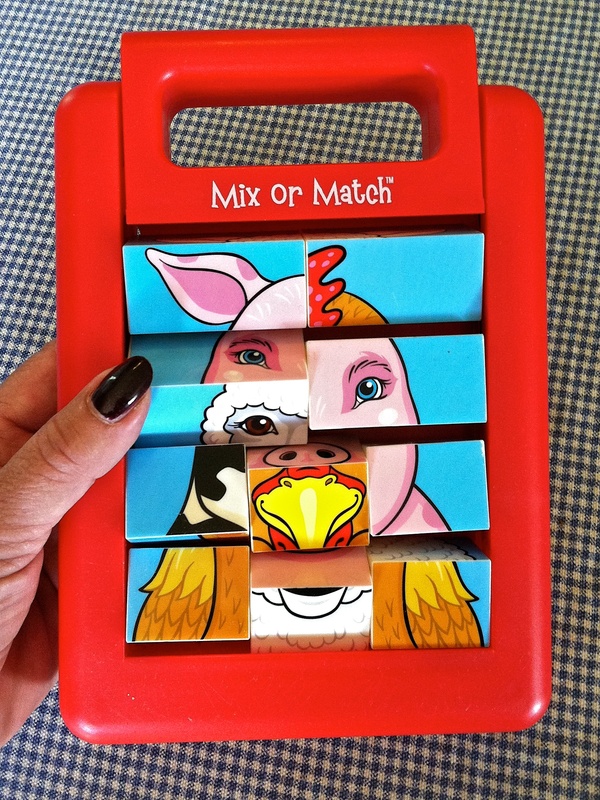 Even more fun than matching the blocks to create each animal face, is mix-matching the blocks to come-up with silly mix-matched faces that incorporate two or more of the different animals. For example, one might have a cow muzzle with pig eyes and lamb ears with a rooster chest. 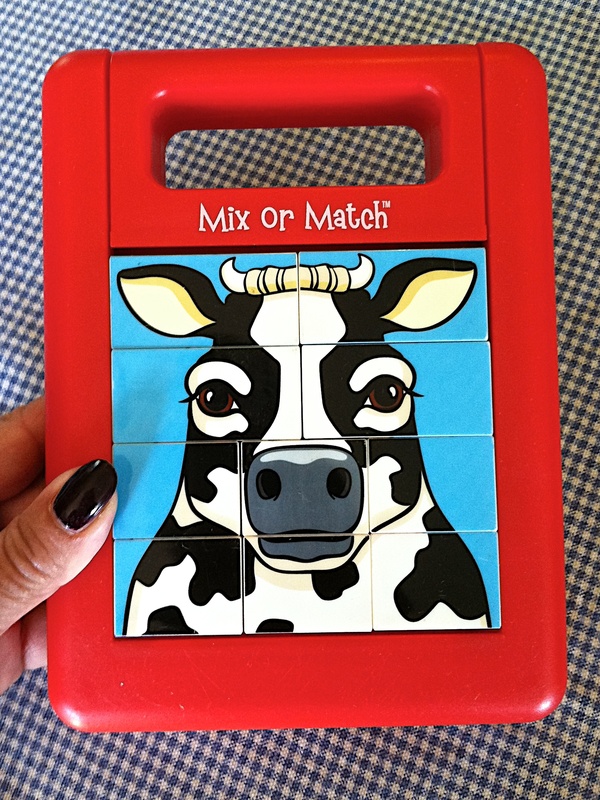 Five years ago, when I first purchased the “Mix or Match,” I hoped it would appeal to my husband’s then-pre-school aged granddaughter. 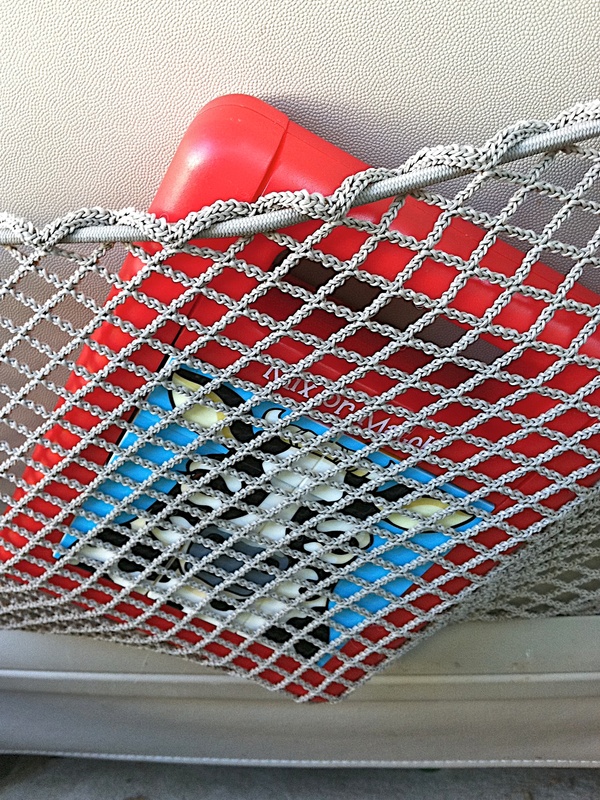 In addition, I wanted an inexpensive plaything that was danger-free; easy to clean; virtually fail-safe to operate; packable in a backpack or tote; easy to carry and use in the car or during an outing; and capable of holding a child’s attention for more than 20 seconds. Whew! By anyone’s standards, it was a tall order to fill. 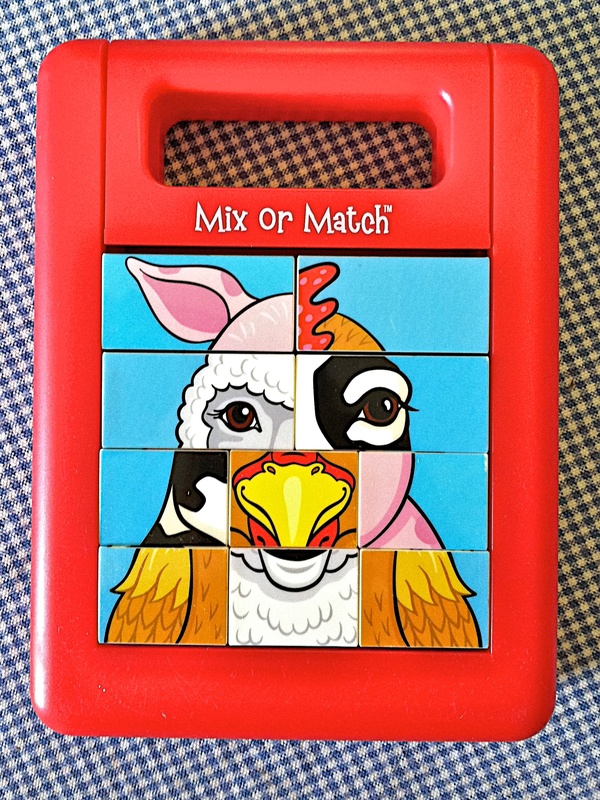 Regardless, I got all that and more with the “Mix or Match” animal farm puzzle. For about ten dollars (cheap by today’s standards), this Dr. Toy Best Children’s Vacation Product Award Winner is a great buy. And, if farm animals don’t make your kids smile, there is a zoo-animal version a well. Better still, after years of use at our house, in our cars, on the hammock, in the field, at the barn, and more, the puzzle still works. It still looks like new. And, it’s still beloved by kids of all ages! All photos taken with an iPhone 4. ©2012 EddinsImages.